This Nativity was hand-formed in clay and painted by Guillermina Aguilar in her studio at San Bartolo Coyotepec, near Oaxaca, Mexico. Guillermina and her three sisters were taught their trade by their grandmother and mother. The four sisters are all famous for their ceramic folk-art specialties. Click here to read a biography of Guillermina. 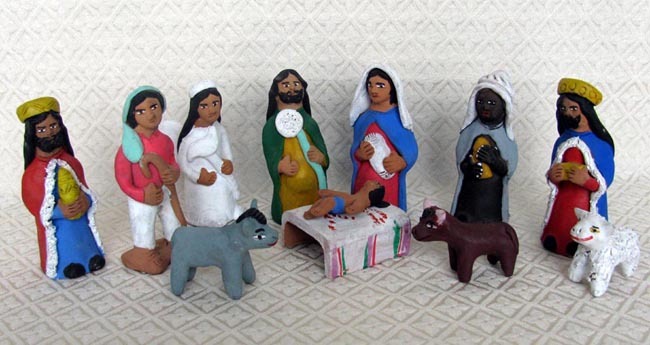 The set includes Joseph (holding flowers), Mary, baby Jesus with a colorful bed, an angel, a shepherd, a donkey, a cow, a sheep, and three wise men with gifts. Each figure is signed by the artist. The Joseph figure measures 4.5 inches tall.